Steven Macy Studios has been delivering picturesque architectural illustrations to architects, builders, and developers since 1991. With an education in both art and architecture, Steven Macy synthesizes his areas of expertise to create dramatic, visually effective renderings that accommodate your needs. We've been in the field since 1975 and have generated a spotless reputation in the industry. Upon our first meeting, we can assess the exact cost of the project you're presenting. We accommodate with our client's demanding schedules and know exactly how to efficiently and accurately perfect a rendering. To find out more on the specifics, please visit our Services page. We encourage you to explore the site and decide how Steven Macy Studios can help you. 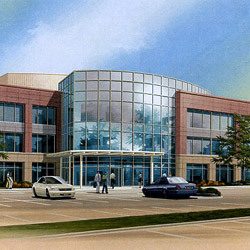 Please call us at 847.640.6315 so we can further discuss your architectural rendering project. Steven Macy Studios is located in Chicago, IL. We have provided our services to the Chicagoland area, including Kankakee, DeKalb, New Lenox, Sugar Grove, Naperville, Lake Bluff, Oak Brook, & Rockford, Illinois. Also, Madison, Waukegan, & Kenosha, Wisconsin, California, Washington, New York, New Jersey, France, Saudi Arabia, and Great Britain.